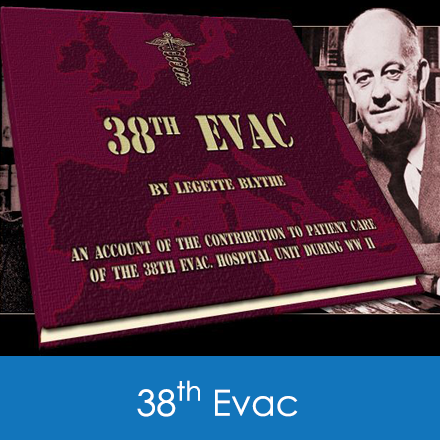 The book, 38th Evac by LeGette Blythe, compiled from letters written to family members at home, is an account of the contribution to patient care of the 38th Evac. Hospital unit during WW II. This marks the beginning of modern-day medicine as rendered by nurses, doctors and businessmen from the Charlotte, North Carolina area. This unit was sponsored by Charlotte Memorial Hospital, now Carolinas Medical Center. This book covers the time period of the unit’s activation in April 1942 through June 1945, when it was phased out. The “Charlotte” 38th Evacuation Hospital Unit was unique from its very inception. First it was envisioned by a group of civilian doctors more than a year before Pearl Harbor was attacked. Secondly, military field hospitals were usually connected to medical schools, and third, it was formed as a local group of doctors and nurses along with some non-medical businessmen - a hometown unit. As soon as it was approved in early 1941, I volunteered, wanting to be a part of this Charlotte effort. We were activated in March 1942, and left for Fort Bragg in April for accelerated training for battlefield operations. By August we were on a ship in the war’s largest convoy headed for England. When the newly formed 38th Evacuation Hospital Unit sailed out of New York in August, 1942, none of us expected it would be two to three years before we would see the United States again. And later in North Africa and Italy, especially, there were moments we could imagine we might not survive to get back at all. These were fleeting thoughts as we focused on caring for the influx of wounded soldiers. What stays most vividly in my memory is the drama that took place almost daily in the surgical tent and recovery ward. Early on I had done office work and was the official cartographer; mapping our locations and layout of each installation as we moved. Finally, I convinced the head surgeon I could be more useful assisting in the operating tent as well. It was here that I watched the doctors and nurses and staff work tirelessly sometimes for two or three days nonstop performing operations under the most adverse conditions. I continue to be amazed at the talent, dedication and ingenuity of these young men and women struggling to repair unbelievably damaged bodies under circumstances never dreamed of in the halls of their medical schools. We lost very few patients but when this did happen we tried to make each one as comfortable as possible, in mind as well as body. The unit grew from just its Charlotte roots to over 600 personnel and 750 beds, but it maintained its reputation of excellence. I am grateful to have been part of this unique unit and proud of the record its men and women earned for the 38th Evacuation Field Hospital. Click any of the links below to display a PDF of the corresponding chapter of the book.